Eighth grade at Norwood is a time of increasing independence and self-awareness. One example of this is community service. Instead of participating with their advisory groups, each eighth grader chooses one organization to serve throughout the year, based on their own preferences. Eighth graders also continue to choose their arts and technology electives, their athletic teams, and their theatre commitments. In all of these areas and in the school in general, eighth graders are the leaders. As Norwood’s “senior class,” eighth graders set the tone for their younger peers and help to nurture the inclusive, caring, and creative community that has benefited them. It’s a responsibility they carry proudly. The eighth grade history course picks up where seventh grade left off in the middle of the 20th century and brings students all the way through present day. Along the way, they wrestle with many current day issues, their origins in the past, and implications in the present day. The year ends with a high school level term paper that allows students to hone important research and writing skills while becoming immersed in topics of particular personal interest. Eighth grade English classes include literature from diverse authors of the 20th century, as well as classics like Shakespeare, and also continue experiences in a variety of writing genres. In science, students experience an intensive lab-based chemistry class, culminating in the famous “Sludge Project,” which requires students to carefully separate a mixture and test the properties of the individual components. Eighth graders finish their middle school math studies in algebra or geometry. In all their subjects, they leave well-prepared for success in high school and with the skills and habits they need to consider new ideas, tackle unfamiliar problems, collaborate with others, articulate their thoughts, and advocate for themselves. Their year-end experiences include a long overnight trip to New York City, a special Class Day celebration filled with performances and speeches, and their commencement ceremony. In eighth grade, most students enroll in algebra. Like seventh grade, the course is taught in two levels in order to best challenge students. Those eighth grade students who have already completed algebra enroll in honors geometry. Students in the geometry course investigate geometric situations, develop conjectures from them, and ultimately progress through the full range of proofs. Topics covered during the geometry class include, among others: reasoning (logic, inductive, deductive), constructions, polygons, transformations/ symmetry, and trigonometry. Students completing this track will have credit in both algebra and geometry. 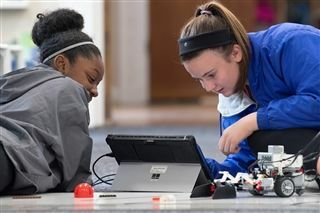 The eighth grade science curriculum centers on very big questions like, “How do we know what we know?” Addressing fundamental questions in science, students apply the lesson, knowledge, and skills that they have built over their careers at Norwood to tackle a series of experiments. While the content is based in physical science, students practice the finer skills of lab science such as measuring volume and mass, progressing from mixtures to compounds to elements. In the process, students learn about some of the characteristic properties, both physical and chemical, by which substances are recognized and separated. The emphasis in the course is on accurate observation and recording as well as completing the experiments themselves. The Sludge Project, where students must identify the substances given to them in a container, is a highlight of the year and a capstone to a Norwood student’s science career. Athletics and alternative offerings provide Norwood students the ability to be involved in a combination of activities ranging from traditional sports such as soccer and basketball to more exploratory choices such as strength and conditioning and Summit, our signature outdoor education program. All of these experiences provide students with leadership opportunities, personal goal setting, and life-long fitness skills. Building on the lessons from the lower and middle school classes, each sport and/or team focuses on sport specific skill sets along with social development, personal improvement, teamwork and sportsmanship. The program includes approximately 25 teams throughout three seasons. Each team practices four days a week for roughly one hour per day not counting games, field trips, special contests, and tournaments. Each morning starts with a community gathering to focus on the value of the month and to prepare for the day ahead. Eighth graders then enjoy a balanced schedule combining history, world languages (Spanish, Chinese, French, Latin), Coding Workshop, English, math, science, Life Skills, music (strings, band, chorus, handbells), art, and study hall. Indiana University - B.A. & M.A. University of Kansas - M.A.